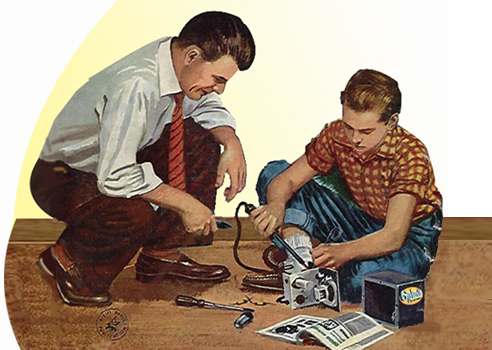 Galaxie Electronics is a family-owned and operated small business in Pittsburgh, PA. We repair, restore and sell modern, vintage and antique electronics. With over 30 years of experience to boot, we are ready to tackle your electronic and audio issues, whatever their form. We carry new, vintage and antique turntables, stereos, speakers and other audio equipment as well as our very own name brand equipment made entirely in house! A One-of-a-Kind Kind of Place! .With over 30 years of professional experience in electronics repair, we welcome your delicate machines and electronic companions. Every machine deserves a second chance and we just plain enjoy making things work again. Download our Service Form and bring it in with your disabled device. Our goal is to provide superior and honest service. That means each repair is restored using high quality parts, is given the individualized attention it deserves and is tested before it is returned to you. Galaxie Electronics is located in Pittsburgh's historic neighborhood of Squirrel Hill. We share a building with Jerry's Records, one of the largest vinyl record stores in the world!